The D-EYE Retinal Imaging System is an innovative device that converts a smartphone into a portable, easy-to-use, affordable, and effective fundus camera. The D-EYE device is a smartphone-sized case that fits onto an Apple iOS or Android phone. The D-EYE fundoscope lens is positioned over the smartphone’s camera and LED light source, enabling the phone to capture high definition video and still images of the fundus of the eye. The D-EYE app installed on the smartphone allows the user to store and manage patient information. 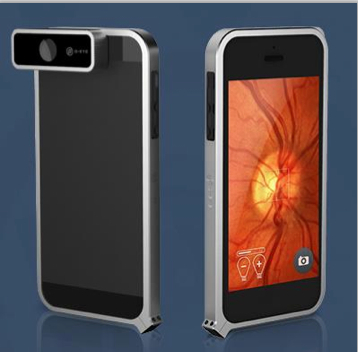 The D-EYE Retinal Imaging System is currently compatible with iPhone 5, 5S, and 6, or Samsung Galaxy S4 and S5.